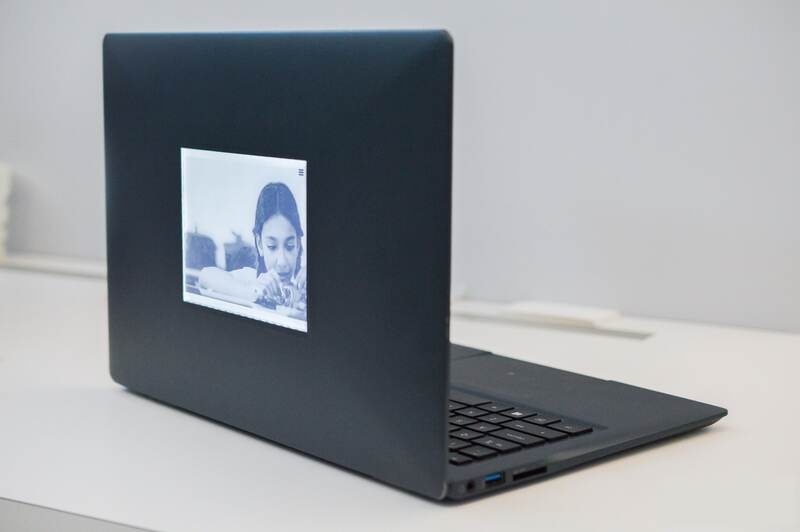 Intel wrapped up their annual developer's conference in San Francisco yesterday, but not before revealing several concept designs, including one which recycles an idea for a laptop with an E-ink screen. Intel's new laptop looks like any other model while it is open and in use, but close the lid and you'll discover an E-ink screen on the rear of the lid. The design is only a concept at this point, but it is being described as potentially like an electronic sticker which a user could read ebooks, images, text messages, or news. "You know how people like bumper stickers on the outside of their laptop? The first idea was just being able to take any image from your hard drive and just post that on the screen," said Taylor Courier, an Intel researcher. Researchers are also working on similar uses, including reading ebooks, RSS feeds, Facebook status updates, and text messages. 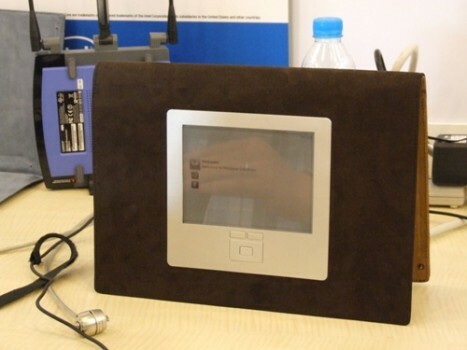 They think that when the laptop is in hibernation mode it will be operating at just enough capacity for the e-ink screen to continue to receive data as the Internet connection remains on. If you ask me, I'm not so sure that's a good idea. A low-power mode still draws power, and if the Wifi is active the drain on the battery can only increase. And since this screen would prove most useful when the user is mobile (and thus the laptop is not plugged in) using the secondary screen comes at a cost which IMO is simply too high. But the technical downsides might not matter too much because I don't think we'll see this in widespread use on the market. The idea has been floating around since at least 2007, when Intel debuted a very similar concept design at their spring developers conference that year. I can't recall that anyone ever built a laptop based on this concept. A few models like the Taichi 21 from Asus featured LCD screens on both sides of the lid, but that's not the same thing. And in any case, that laptop flopped. I think a good idea would be a an e-ink laptop/word processor. May be 12 inch screen, with enough processor power to make the writing experience seamless. There could be access to Android, which is enough for on the go writing. Agreed! I am desperate for a simple, light word processor with a black and white e-ink screen. Like a portrable typewriter… Pads and laptops are great for just about everything, but all screens are tiring over long periods of study and work and also far too expensive for most students typing up lecture notes! Yes, but it is also lower resolution. I suspect that most people don’t use a laptop for long reading. They use a tablet. An epaper screen on the flip side or a tablet, or perhaps built into a tablet case, makes more sense. Create an energy-saving mode that turns off WiFi, and sleeps the tablet between page turns, etc and it should have a quite a long battery life. Also, the epaper screen wouldn’t need a backlight. In darkness, the user could simply use the tablet’s screen. The epaper screen would be for reading in sunlight. That’s the big weakness of tablets. Of course what the market really needs is a kid’s epaper reader that’s rugged, waterproof, and would fit in the pocket of jeans. All the current ones are intended for an adult’s coat pocket and are a bit too fragile for a 9-year-old boy.